How true were PM Modi’s claims made during Independence Day speech? 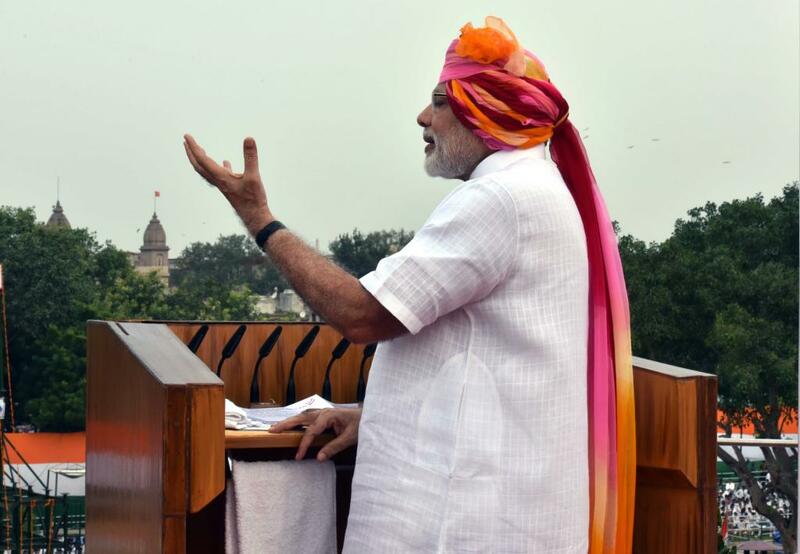 During his speech from the ramparts of the Red Fort on 70th Independence Day, Prime Minister Narendra Modi made several claims about the progress India made during his regime. He cited facts and made comparisons to drive home the message—the government is performing, reforming. However, a probing look into his claims reveals that not all that he said are in sync with the official data. While some claims were exaggerated, some were half-truths. Claim 1: Modi claimed that despite successive droughts, our farmers had sown 1.5 times the pulses that were sown earlier. Fact: Out of the 13 million hectares of land under pulses, 1.4 times the sowing was reported in about 7.1 million hectares of land. Claim 2: PM said that his government has built more than 20 million toilets ever since he took office. Fact: While the PM got his fact correct, he didn’t mention the target that his government was supposed to achieve every year to meet the goal of building 113 million toilets by 2019. According to the official data, the government has built 22.5 million toilets between FY 2014-15 and 2015-16. In next three years, it has to build about 90.5 million toilets at a rate of 30 million toilets every year. Claim 3: Modi said that out of 18,000 unelectrified villages (Census 2011), over 10,000 villages have been electrified. Fact: There are several discrepancies in the official data on rural electrification. Villages, which do not meet electrification criteria, are considered to be electrified. Apart from data gaps on electrified villages, inconsistent power supply also raises doubts about the success of rural electrification. Moreover, government data (as on August 4) reveals that the actual number of villages electrified was 9,481 and not 10,000. Claim 4: When talking about boosting solar power capacity, he said that India has “seen an unprecedented growth of 116 per cent”. Fact: Assuming that Modi was referring to the increase in solar power production in past one year, he exaggerated the growth because India’s solar power capacity increased from 4 gigawatts (GW) in June 2015 to 7.8 GW in June 2016—an increase of 95 per cent. Earlier on July 28, 2016, the Renewable Energy Minister Piyush Goyal had claimed that India’s solar power capacity increased by 300 per cent in nearly two years. Claim 5: The PM said that the government had paid off about 95 per cent of the dues to sugarcane farmers in Uttar Pradesh. Fact: While talking to DownToEarth, sugarcane farmer leader Vikas Balyan said that out of the total due of Rs 18,000 crore, the government still hasn’t paid Rs 2,700 crore, which is 15 per cent of total due. In May, Modi had claimed that the dues to sugarcane growers had reduced to Rs 700-800 crore. However, the data from the Cane Commissioner’s Office in Lucknow revealed that cane dues of UP mills were Rs 5,795 crore. Claim 6: Modi said that the government made huge subsidy savings from direct benefit transfer (DBT) policy. Fact: On August 12, the CAG report revealed that only Rs 1,764 crore in subsidy was saved on LPG on account of the scheme and the bulk of Rs 21,552 crore was due to sharp fall in global prices. Claim 7: Modi claimed that 5 million LPG connections were given under the Pradhan Mantri Ujjwala Yojana. Fact: While 3.5 million applications have been cleared so far, connections have been issued only to 1.7 million households. Claim 8: The PM claimed that 210 million people have bank accounts under Pradhan Mantri Jan Dhan Yojana. Fact: While more than 228 million bank accounts have been opened in two years, as many as 24 per cent of these accounts still do not have money in them, according to a report by IndiaSpend.